I thought he [Scruggs] was a pretty good model because he played with a kind of taste that was really good, and a lot of technique that wasn’t played to show off the technique per se. Since I had already played the tenor banjo, I didn’t worry about my left hand as much and I paid a lot of attention to the right. Quoted by Tony Trischka in “Bill Keith,” Bluegrass Unlimited, December 1975. William Bradford “Bill” Keith was born in Boston, Massachusetts, on December 20, 1939. He spent much of his early youth in San Antonio, Texas, where his father, Eldon Bradford Keith, was stationed at Lackland Air Force Base. In 1945, the Keith family relocated to the Boston suburb of Brockton. Bill’s first involvements with music were four years of piano lessons and “a little dabbling” with a ukulele. His first exposure to bluegrass came when he heard what he later learned was the instrumental “Cheyenne” while listening to WWVA from Wheeling, West Virginia, on the radio. The sound of the banjo evidently affecting the youth, he was soon playing tenor banjo (he didn’t realize at the time that there was a difference) in local ragtime ensembles. In 1958 Bill entered Amherst College in Massachusetts and was exposed to a recording by The Weavers folk music group, which included banjo picking by Pete Seeger. Within days of this, he saw an ad for a five-string banjo that was available for fifteen dollars. Additional Seeger records and a copy of Pete Seeger’s banjo instruction book (the second “yellow” edition) set Bill on his way. On advice contained in the Seeger book, Bill sought recordings by Earl Scruggs and Don Reno; the bluegrass style of banjo playing on these recordings appealed most to Bill’s ears. On visits home from college, Bill came in contact with a Nova Scotia fiddler, June Hall, who had relocated to West Bridgewater, Massachusetts. Hall knew hundreds of fiddle tunes and soon set the wheels in Bill’s head turning in search of a way to play these fiddle tunes on the banjo. In the fall of 1959 “Devil’s Dream” became the first tune that Bill worked out in a note-for-note melodic style. While at Amherst, Bill met Jim Rooney, a guitarist who had a radio show on the college station, WAMF. The two soon found themselves in the audience at Boston-area performances by the Lilly Brothers and Don Stover. Bill and Jim began to perform together and, in the summer of 1960, made a trip down south that included stops in Asheville, North Carolina, and Galax, Virginia. Musical forays closer to home included New York’s Washington Square and Gerde’s Folk City, and the Philadelphia Folk Festival where – in 1962 – Bill won first place in the banjo competition. Following graduation in 1961 Bill served a stint in the U.S. Air Force Reserve. In 1962 Keith and Rooney recorded an album for Prestige/Folklore called Livin’ on the Mountain. The album contained landmark recordings of Bill’s melodic banjo playing, including “Sailor’s Hornpipe,” “Devil’s Dream,” and an inspired break on “Salty Dog Blues.” In the fall of that year, Bill visited Tom Morgan in Washington, D.C. to learn more about instrument building. The two became members of one of the best traditional bluegrass bands of the early 1960s: Red Allen, Frank Wakefield and The Kentuckians. Bill’s fascination with Scruggs-style picking led to his making tablature transcriptions of banjo recordings by Flatt and Scruggs for his own use. At a meeting with Earl Scruggs at a 1962 concert in Baltimore, Bill learned that Earl was working on a banjo instruction book. An invitation was extended and, in the early part of 1963, Bill came to Nashville to lay the groundwork for tablature additions to Earl’s book. The Nashville trip included a backstage visit to the Grand Ole Opry, where Bill informally played his renditions of “Devil’s Dream” and “Sailor’s Hornpipe.” One of the people these tunes most impressed was Bill Monroe. Although Monroe had recently hired Del McCoury to play banjo, he wanted to have Keith in the band as well. To avoid having two banjoists in the Blue Grass Boys, Monroe auditioned both players. While both men shone on the banjo, McCoury was clearly the better guitarist. Consequently, McCoury shifted to guitar and Keith assumed the role of banjoist for the band. Keith worked with Monroe for most of 1963. To avoid the confusion of having two Bills in the band, Monroe dubbed his new banjoist “Brad.” During his tenure, he helped to record two sessions for Decca, laying down tracks for seven songs and tunes: “Salt Creek,” “Devil’s Dream,” “Sailor’s Hornpipe,” “Were You There,” “Pike County Breakdown,” “Shenandoah Breakdown,” and “Santa Claus.” “Brad’s” stay ended after about nine months, due to conflicting obligations with the Air Force Reserves. It was also in 1963 that Bill Keith and his friend Dan Bump developed what came to be known as Keith Tuners, devices that allow banjo players to quickly and accurately change the tuning of a banjo string from one note to another without drilling holes in the instrument’s peghead. By 1985, their Beacon Banjo Company had sold more than 20,000 of the tuners worldwide. In 1964 Bill recorded classic sessions for the Red Allen/Frank Wakefield Folkways release Bluegrass, and began a four-year stretch with the Jim Kweskin Jug Band. This Boston-based outfit featured updated versions of pre-World War II rural music and included among its members Fritz Richmond, Geoff and Maria Muldaur, Bob Siggins, and Bruno Wolfe. Among their recorded output during Bill’s tenure were Jug Band Music, See Reverse Side For Title, and Garden of Joy. 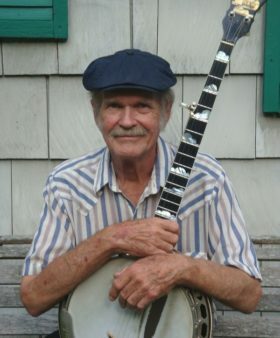 Over the next decade Bill played in a variety of groups including the Blue Velvet Band (with Jim Rooney); Ian and Sylvia; Jonathan Edwards; Judy Collins; Muleskinner – an influential progressive bluegrass band that included notables Peter Rowan, Clarence White, Richard Greene, and David Grisman – and Jim Collier. While with Ian and Sylvia he temporarily abandoned the banjo in favor of the pedal steel guitar, an instrument in which he maintained an active interest for a number of years. In the 1970s and 1980s, Bill Keith and Jim Rooney toured the United States and Europe and built a significant following in France. Bill had majored in French literature and maintained his fluency in the language with his French wife Claire, whom he married in 1976. Sons Charles and Martin were reared in a bilingual household. In 1970 the family moved to Woodstock, New York, which remains home today. Local performance opportunities came with the Woodstock Mountain Review, a group with whom he has played off and on over the years. In addition to recordings mentioned previously, Bill’s impressive resume of releases has included Sweet Moments with the Blue Velvet Band, Album III by Loudon Wainwright III, Muleskinner: a Potpourri of Bluegrass Jam, Bill Clifton’s Clifton & Company, Banjo Paris Session with Jim Rooney, The David Grisman Rounder Album, Fiddle Tunes for Banjo with Bela Fleck and Tony Trischka, Peter Rowan’s The First Whippoorwill, The Grass is Greener with Richard Greene, and several of his own solo albums: Something Auld, Something Newgrass, Something Borrowed; Banjoistics; and Beating Around the Bush. Teaching has been an important part of Bill’s professional life, as a one-on-one instructor, leader of group workshops, columnist (for Frets magazine in the 1970s), and through books, CDs, and DVDs. Some of his instructional releases for Oak Publications, Mel Bay, and Homespun include Bluegrass Banjo (with Jean Marie Redon), Pedal Steel Guitar (with Winnie Winston), Play Bluegrass Banjo by Ear, and Advanced Banjo Workshop (with Tony Trischka). 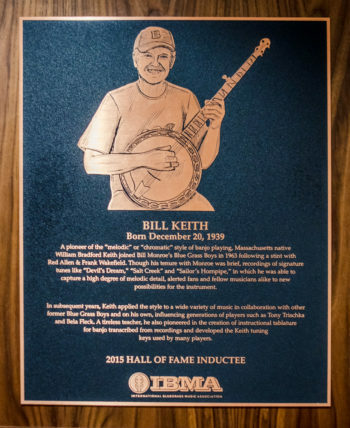 Bill was honored by his peers at the Keith-Style Banjo Summit, hosted by Béla Fleck and Tony Trischka, at the Grey Fox Bluegrass Festival in 2015. The same year also saw his induction into the International Bluegrass Music Association’s Hall of Fame. Gary Reid is a bluegrass music historian, journalist, producer, and actor based in Roanoke, Virginia. With thanks to Bill and Claire Keith, and to Bob Carlin who supplied information from his forthcoming book on Bill Keith. The basic difference between that [melodic banjo style] and the regular Scruggs style is that the hands are working together with a much higher degree of cooperation. With the regular Scruggs style, you can play a certain right-hand pattern or roll and you can do a lot of different things with your hand… When you play chromatically, you’re pretty much playing note for note, whereas in the regular Scruggs style, it’s more apt to be lick for lick. Quoted by Roger H. Siminoff in “Bill Keith,” Frets Magazine, March 1980. Working with Bill Monroe – not just as an observer…trying to add something that would compliment his music, and not to contradict its aesthetics with some ill-chosen musical statement – I was editing a lot of the ideas that I had coming along and learning to play right. It’s not right or wrong, but some things are more right than others. You listen to bluegrass music enough, and you can tell. Quoted by R. J. Kelly in “Bill Keith – Sharing a Banjo Tightrope,” Bluegrass Unlimited, January 1985. I try to create situations where I’ll have to play or find time in the day where I can just sit down and do nothing else. It’s not the first thing that pops into my mind when I come back from a recording session or a road trip, but I usually try to play some in the morning. Quoted by Roger H. Siminoff in “Bill Keith: Yesterday, Today, and Tomorrow,” Pickin’, December 1977.